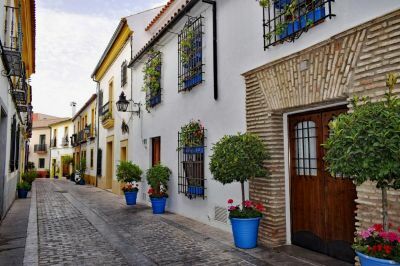 Cordoba is one of the three great Moorish cities of Andalucia where the Moorish atmosphere blends with the best produced by its Christian liberators. Capital of Moorish Spanish, with an impressive 8th century Mosque, now a Cathedral. Half-day guided visit of the Mosque & Jewish quarter, see the Statue of Maimonides and walk the Calle de los Judios (Street of the Jews) to the ancient synagogue and also the Alcazar. The Alcazar was constructed as the residence of the Cordovan caliph and thereafter became the royal residence of the Tribunal del Santo Oficio, later a civil prison, and lastly a military prison. Surrounded by magnificent gardens called the Paseo de los Reyes where there are statues of all the kings linked to the palace-fortress. In Cordoba meet with our local guide right next to the gorgeous 8th century Mosque. We have reserved a table for your lunch either before or after the tour at a recommended restaurant.